First, thanks for all of the comments about the tidepool socks. I still am waffling back and forth on them. Maybe I am being to precious with this yarn, but I want the resulting item to be stunning. And the current sock does not do it for me. So I will continue to think about it. For the green alligator socks, I am trying to overcome "first sock syndrome". The last few times I have picked it up, it has seem like a real chore to work on them. But my husband is really enthusiastic about them, which does motivate me. The secret knitting is progressing well. I need to work on it this evening. I have also been spending way to much time exploring Ravelry. I signed up about a month ago to get an invite to be a beta tested. I got my invitation about a week ago. It is a cool site, but man is it easy to get lost in there. Major time vacuum. You can still sign up to be a beta tester. 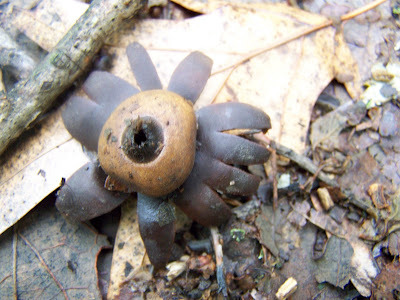 And just because, an earth star fungus.